Officially, 2018 has been the 4th hottest year on record, fulfilling a dreadful pattern: the past five years have been the hottest since mankind started recording global temperatures in 1880. This is no coincidence — it’s a clear exemplification of the warming trend our planet is experiencing, and that we are causing. Global average annual temperature anomalies from NASA’s global Land-Ocean Temperature Index data set (1951-1980 base period). Graph and highlight credits: Logic of Science. “The key message is that the planet is warming,” Gavin Schmidt, the director of NASA’s Goddard Institute for Space Studies in New York City, told reporters at a news conference. “And our understanding of why those trends are occurring is also very robust. It’s because of the greenhouse gases that we[‘ve] put into the atmosphere over the last 100 years. 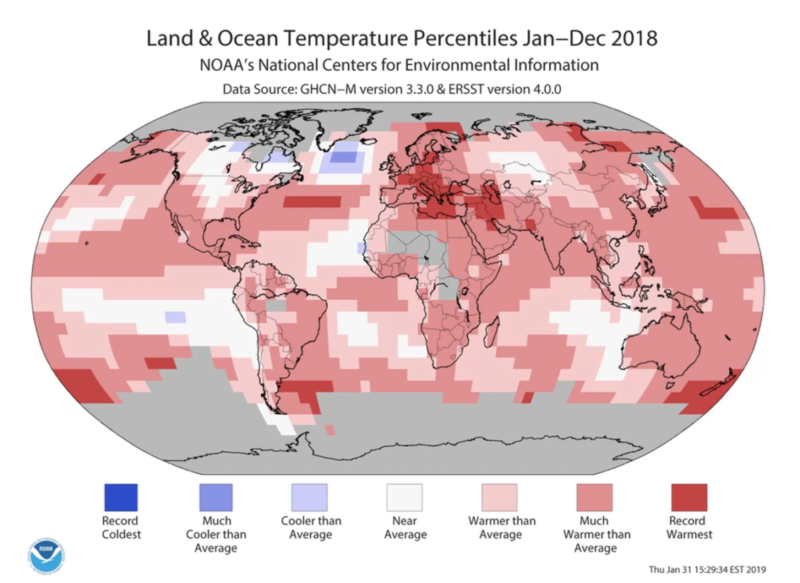 Both NOAA and NASA have confirmed that 2018 was the 4th hottest year on record. They also double-checked their data with other external and independent groups, further confirming the results: last year, global land- and ocean-surface temperatures were 1.42 degrees Fahrenheit (0.79 degrees Celsius) above the 20th-century average. The warming wasn’t uniform, however. In North America, temperatures were closer to the century average, but the difference was more than made up for in other parts of the world. Yet even without elevated temperatures, the effects of climate change were visible in the US. It was the third wettest year on record — yet at the same time, drought ravaged parts of the country. There were also much more extreme weather events than normal, something which is increasingly attributed to climate change. Researchers also warned that the climate change and the damage will pale in comparison to what we will experience in the future, especially if we continue to spew carbon at the rate we currently are. All models and measurements consistently show that the planet is warming. Credits: NASA Earth Observatory / VOX. The data in case is extremely reliable, and climate scientists have gone to great lengths to avoid any potential uncertainties. For instances, they factored in how different methodologies for data acquisition and processing may have changed over the years and factored in the “urban heat island” effect” in which cities are warmer than the surrounding environment. Nowadays, agencies collect most of the data from rural areas — which is also controlled for. Overall, you could hardly imagine more convincing data to show that climate change is happening. So one can only wonder — for those people who don’t “believe” in climate change (although believing in a scientific reality doesn’t really mean anything), what would it take to convince them? Would that even be possible? Or is it a “hoax” or a “liberal conspiracy” no matter what the evidence says? Now is a really good time to remember that science is non-partisan, and the science says we’re causing a lot of trouble for ourselves and the rest of the planet. It’s time to reduce emissions and start cleaning up after ourselves.